Did your company take the shortcut of using SD RevRec in ECC to comply with ASC 606 and IFRS 15? Then you are probably looking for a better path forward to go beyond mere threshold compliance. 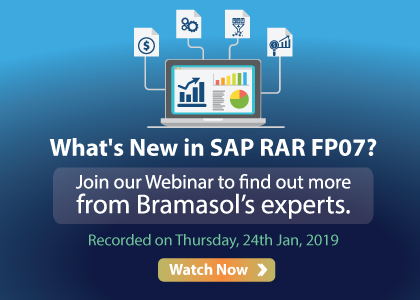 If so, you should look at the newest release of SAP RAR (FP07). A major achievement in FP07 is seamless parity with existing features in SD RevRec, which opens a cost-effective path for companies to transition their Revenue Recognition processes into a more sustainable forward path. This also makes it possible to leverage advanced analytics in SAP for RevRec management. Other features include improvements in SSP Attribute Changes, enhanced POB Validation, Compound Structures with Non-distinct POB, Positive and Negative Allocated Prices, enhanced Tracking of Contract Changes, Integration of Proof of Delivery Process with SD RevRec processes, and much more. If you’re seeking to make your RevRec processes future-proof, this is the webinar for you.